NBC and ABC demonstrated this week that newsmagazines have not lost their ability to be provocative — or offensive, depending on your point of view. Detroit leaders, accompanied by Vickie Thomas, president of the Detroit Chapter of the National Association of Black Journalists, and Bankole Thompson, senior editor of the Michigan Chronicle, a black weekly, are expected to meet with "Dateline NBC" producers in New York on Monday to discuss what they say is the program's negative portrayal of the city, as Leonard Fleming and Mark Hicks reported Thursday in the Detroit News. [On Saturday, the NABJ chapter issued a statement saying it will not be at the New York meeting, but objected to the portrayal. ["We believe Dateline should return to Detroit to present 'the other side of the city,' Thomas said," the statement continued. ABC's "Nightline," meanwhile, returned to the subject of black male-female relationships, engaging in what social critic Melissa Harris-Lacewell called "superficial, cartoonish dialogue that relied heavily on personal anecdotes and baseless personal impressions while perpetuating damaging sexism." 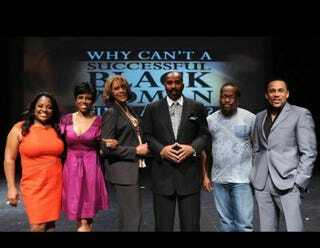 Columnist Jenice Armstrong of the Philadelphia Daily News said she could not bring herself to watch the two-hour forum, "Why Can't a Successful Black Woman Find a Man?" asking readers, "What more could possibly be said on this subject?" Demetria Lucas, relationships editor of Essence magazine, was more charitable, "I took away some useful male insight from the panelists — I am the potential link to a man's success, men may be more ashamed of their lack of success than 'intimidated' by a woman's accomplishments, and men aren't trying to see me taking out my hair. But ultimately, what I re-learned was the biggest obstacle to building healthy relationships might be an inability to catch on to the fundamentals like communication and hope." NBC's piece on Detroit began with this declaration by Chris Hansen: "They litter the landscape, thousands and thousands of abandoned homes. And just like these buildings, Detroit is a shell of its former self. One third of the people here live in poverty. Almost half the adults are illiterate, and about 75 percent of kids drop out of school. I could be describing some ravaged foreign nation, but this is the middle of America. I grew up in the Detroit area, and just like the people who live here, I’ve often wondered how can this city be saved? It starts with the people on the front lines." "My hope is . . . they'll see why people are disgusted and understand how these circumstances are created and do a more balanced report," said the Rev. Horace Sheffield, a prominent pastor, civil rights activist and executive director of the Detroit Association of Black Organizations," the News story reported. "The main point is that Detroiters . . . did not create this dismal environment completely. Yet people want to make us solely responsible. If you want to expose what's wrong, you need to expose who's responsible," Sheffield said in the story. The News said Mayor Dave Bing's "office was swamped with phone calls and e-mails complaining about the report and the way it made Detroit look to the nation." Video from "Dateline": "Cleaning up Detroit from the bottom up"